Our Scale Helps us to Reduce Waste, Accurately Weigh our Meat, and Ensure Customer Gets What was Ordered. We dare you to read this blog post and not crave a big juicy burger! 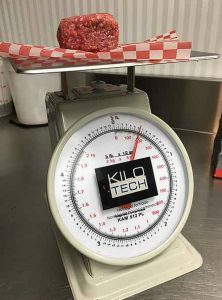 The pictures and the write up tell the story about how a restaurant uses the Kilotech counter top dial scale for simple and consistent check weighing. Whether you’re weighing ingredients for gourmet burgers or pizza, the ingredient costs can really add up and customers love consistency when it comes to their foods they order on a regular basis. So let’s take a look at Notre-Boeuf-de-Grâce, cleverly named after Notre-Dame-de-Grâce, the Montreal neighborhood where it resides. 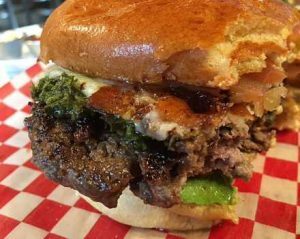 Do you ever crave a burger where the flavor explodes the minute you sink your teeth into it? Top the burger with super fresh ingredients and it is like a party in your mouth! Well two years ago, in my quest for gourmet burgers, I chanced upon a new upscale burger place called Notre-Boeuf-de-Grâce. The décor is a mix of brick, wood and glass, designed to enhance your culinary experience. The music is excellent and covers most tastes. Their menu offers something for everyone and most certainly will not leave you hungry. Fresh meat is ground daily and is always gluten-free because there are no fillers. There are also vegetarian options for the non-carnivores. Choose from their fresh cut fries (they really are fresh as we brought some home and two days later they were still intact, not soggy or hard! ), beer battered onion rings, sweet potato fries and potato skins to complement your burger. Also available and made in-house are their gravies, sauces, milkshakes and cocktails. Notre-Boeuf-de-Grâce also supports local suppliers and serves locally-grown food as much as possible. A couple of weeks ago, while dining at the Notre-Boeuf-de-Grâce Côte-Vertu location, the manager Dennis Mandros approached us and asked us how we were enjoying our meal. Considering how busy the restaurant was that night, we were surprised to see that the manager was going from table to table providing that personal VIP touch! I took the opportunity to ask him if he used a scale to weigh his patties. When he replied, “Yes, absolutely!,” I just had to know if it was a Kilotech scale. Dennis immediately went to the kitchen and like a proud father of a newborn child, held a Kilotech scale in his hands to show me! I knew then and there I had to write a blog about Dennis and his restaurant. When a restaurant uses a scale to ensure that their customers get what they paid for you know that they have the customers best interest at heart. A few weeks later, on a beautiful Monday afternoon, I showed up at the restaurant. Dennis Mandros and Zakria Dehghani, the owners of this franchise, were hamming it up with their customers on the terrace. When they spotted me, they both greeted me with the kind of warm smiles you reserve for your long lost friends. I sat down with Dennis and we talked business. I quickly cut to the chase and asked him what his Kilotech scale meant to them. Without hesitation Dennis said that it helps them to reduce wastage, accurately weigh their patties, and more importantly, ensure that the customer gets exactly what was advertised and ordered. Their burgers come in three sizes: 3, 6 and 9 ounces. Dennis asked one of the cooks to grab a 6 oz. patty. He placed it on the scale and immediately the scale showed 6 oz. Dennis beamed! He is proud of his restaurant and the integrity with which it operates. If you operate a restaurant, bakery or some other type of food related business; contact us at (919) 776-7737 and let us assist you with your weighing needs. It could be that you need a simple way to make sure your hamburgers weigh the same. Or it could be something else, either way, the odds are we can find a solution for you that will save you time and save you money.